VILLA ULIVO, or the Villa of Olive Trees, takes its name from its location, being nestled within nearly 2 acres of its own private olive groves, famous within this region of Italy. With its own private swimming pool. Set back from a quiet road, behind a private gate and down its own private drive, it is located under 30minutes drive from the modern Brindisi airport, and an hour from Bari. Although the villa is believed to date back to the 1930's it has recently been completely remodelled, creating a wonderfully versatile, spacious, modern and stylish property. With four double bedrooms and two shower-rooms, air-conditioning throughout, it very comfortably sleeps up to eight adults. In addition to the modern, well-built and well-appointed kitchen, it also has a generous lounge that opens out directly onto the 40 ft terrace overlooking the pool, and BBQ - fantastic for al fresco dining in the summer! There is also a large pagoda below the pool area where you can enjoy views across the land. A private massage under the pagoda can also be arranged at your convenience by the villas local visiting masseuse. (payable locally). The villa also has a private chef available to cook for you at the villa, or you can enjoy a cookery lesson outside in the outdoor kitchen for a local charge. 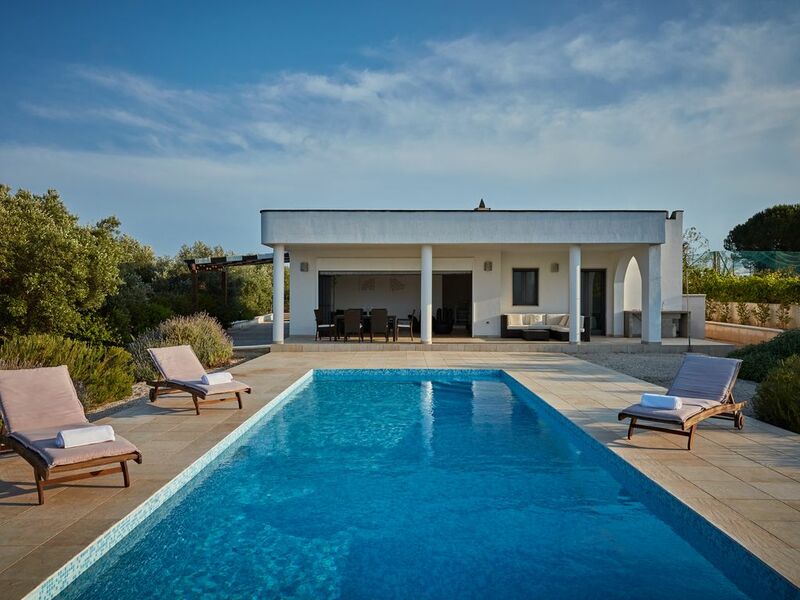 As Puglia's popularity has grown to be all year destination we have recently installed modern gas central heating as well as an open functioning fire place, which means the villa can be enjoyed all year around, whatever the weather. For the more active and working with the local stales horse riding can be arranged on site and further afield, again payable locally. Villa Ulivo is only 3 kilometers from an area known as Torre Guaceto and its location in a nature reserve makes it one of the best beaches in the Puglia region. The towns of Carovigno, Ostuni are within an easy ride and are renowned for their culinary excellence. This is comtemporary living in True Italy! We finally arrived at Villa Ulivo at 10 o’clock at night, due to taking a wrong turning in the dark despite the clear directions. The owner’s agent, Antonio, was there to show us around the villa. We were pleased to find a chilled bottle of Prosecco in the fridge and a welcome pack of food. The villa is comfortably furnished, and there’s ample space, both inside and out. The kitchen has most appliances, including a dishwasher and washing machine; a microwave would be a useful addition. The bedrooms are simply furnished and have air-con that’s welcome at night. The two shower rooms are small but adequate. The living room has a generous sized leather sofa on which we enjoyed watching DVDs on the flat screen TV. The large swimming pool is kept crystal clear and is flanked by olive trees and aromatic bushes of lavender, sage and rosemary plus some aloes. It’s generally private and peaceful apart from the intermittent barking of dogs a few km away and the occasional activity of tractors. There is a neighbouring house—with its own sports pitch, bizarrely—but this seems to have been abandoned. The outside seating area is perfect for chilling out during the day in between dips in the pool and getting some sun. There’s also a gazebo-like area (perhaps once used for al fresco video screenings) that’s excellent as a spot for lunch. The Familia supermarket in nearby San Vito dei Normanni is comparable to a large supermarket in the UK and has everything one needs for self-catering. Specchiolla has some beach clubs, but most appeared closed during our stay in mid-September. The one-way system in Specchiolla takes some getting used to. We stopped by the three-star Hotel Belvedere in Specchiolla between checking out from the villa and leaving for the airport. La Lampara in Specchiolla is an unprepossessing but decent seafood restaurant with a fresh fish counter. Ostuni has an attractive, white-painted old part with a cathedral but parking is a nightmare and there’s the usual urban sprawl around it. Restaurants in Ostuni are aplenty, but those in the main piazza are pricey. We enjoyed some unusual but delicious vegetarian Puglian food at Garibaldi. I’m afraid we succumbed to feeding a malnourished black cat and her three young kittens that had made the villa their home. Future guests are sure to encounter them and it’s better that they’re healthy and get used to people. We’ve left the bowls behind. But the cats should really be spayed. We had a lovely week near Caravigno. The villa is modern and comfortable and the location is quiet (apart from a lot of dogs barking two or three times a day about a kilometre away.) Antonio met us at the villa and showed us round. We didn't need his help during the week but I'm sure he would have been great had we done so. There are neighbours but we didn't see anyone and enjoyed having privacy and the chance for the children to be as loud as they wanted. We enjoyed visiting Ostuni (40 minutes away) and Martina Franca (about an hour) and were regulars at Lido Bianco beach at Specchiolla. (avoid Laguna Blu, the first beach club you come to like the plague! Keep driving, go,past Hippocampo pizzeria and Lido Bianco is the next building on your left. 15-20 euros in July for 2 sunbeds and an umbrella. The only bad thing is you're not allowed to take any food in- the restaurant is good though.) We loved the pool at the villa too- refreshing and clean and had lovely barbecues in the evenings. Plenty of restaurants in San Vito and Caravigno although you must book in July. The transfer from Brindisi is really easy- about 20 minutes by car and Russell provided great instructions which we should have followed, rather than letting our sat nav try to take us down a so-called short cut! Everything you need, a house made for enjoying the hot summers and the luscious outdoors. In a lovely rural location with two towns and the beaches just 10 mins drive away. The bedrooms are well appointed and had surprisingly comfortable beds. The Kitchen has all the facilities and things you need, and the bathrooms are clean. Like lots of properties in this part of the world they are built to make the most of the outdoors which is perfect for the summer. In the off season however, there are a few improvements which could be considered to make it more comfortable. We were there very early in the rental season so the house was, as expected cold (22 degrees and sunny during the day). It was very difficult to heat up the large lounge with the single AC/heater unit and the dining room (which only has a small table two chairs) has no heating at all. The bedrooms were a little more manageable but still required us to sleep in multiple layers. We were met warmly by Antonio and his wife Angela. Antonio responded promptly when we had an issue with the hot water arriving with a plumber on a Sunday..
On sunny days the property is at it's best with its lovely outdoor space. Plenty of sun loungers, two dining spots and an outdoor sofa. The pool is a good size and surrounding area is planted with Lavenders, Rosemary and Sage. Further afield, Lecce is 45mins drive and well worth a visit, Ostuni is 20mins and Bari airport 90mins. Beverley we are pleased you enjoyed the villa and area as much as we do. It is a special spot! We hope that you are able to come back to the villa in the not too distant future to enjoy these enhancements. We will also pass on your positive comments to Antonio & Angela. Thank you once again for your feedback, it is really important to us, we are pleased you had a lovely holiday on our villa. We spent 3 weeks in septembre and had a great time at Ulivo. It’s a perfect getaway. Well designed and convenient. Privacy, comfort and security surrounded by olive trees. We also appreciated the friendly welcome and non intrusive good care of Antonio and Angela. With 90F° temperature we enjoyed the A/C and crystal clear swimming pool. The secluded location requires a car but is close to a great preserved beach and centuries old olive grove (Torre Guaceto). We didn’t try many restaurants nearby as we found excellent food and wine in the vicinity, so we cooked. Location is excellent for Puglia exploration, coming back in the evening for a swim, BBQ and a good night sleep. Sometimes just farniente by the pool. Looking forward to come again. Many thanks. The villa has a modern interior design with bi-fold doors that open the large living room out into the garden/pool area. It was a clean, well decorated family home in an area of Italy that has many local restaurants and historical towns. The local family who look after the villa were very helpful without being intrusive, quickly carrying out pool and house cleaning when necessary. The BBQ area has a sink and gas ring nearby, which was very useful when cooking the local seafood. We visited the local restaurant 'La Dolce Vita' in Caravigno which has the most delicious anti-pasta. But bring cash as they do not accept credit cards. The air con and pool were really needed when we were there in June and provided much relief from the heat. A very nice base for an enjoyable holiday. Went here with 3 children for 1 week, ages 5, 8 and 10. The interior was immaculately presented and we were met by the Housekeeper who was extremely helpful in all aspects, including meeting us from our delayed flight at 11 o clock at night. The villa is set up with all mod cons, including wi-fi, dvd etc but the kids spent most of the time in the pool or exploring the grounds. Due to the location and lack of neighbouring houses you truly felt able to relax and wind down which is a big selling point. The exterior of the house is equally well furnished with a great seating area. overall a fantastic, well equipped villa. The villa is located under 4 km from the sea, in the countryside between Carovigno and the coastal resort of Specchiolla, 20 minutes from Brindisi airport and 65 minutes from Bari. Carovigno is the last town on the edge of Le Murge - the upland plains of Puglia - before the land gradually falls in height to meet the coastal plain of Brindisi. Close by are various beach resorts, small ports, and the internationally protected nature reserve of Torre Guaceto. Carovigno itself is an historic town, rich in folkloric festivals. For a small town (circa 14,000 inhabitants) it is surprisingly lively, and a real centre for gastronomy, with numerous good restaurants and shops, and a market on Tuesday mornings. It is also within a short drive or cycle ride of several fine beaches, and well-situated for many places of interest, such as Alberobello, Lecce, Martina Franca, Ostuni, and Castellana Caves.